Besides being aesthetically beautiful their unique features give your home and office that clean look. With Panelast Ceiling and Wall Panels say goodbye to your termite and fungus problem in your ceilings. We have a wide choice of beautiful finishes and colors to stimulate creative imaginations. Panelast Ceiling Panels are double ply and come in standard lengths of 6m in length and 100mm and 200mm in width. Panel thickness is 10mm. As our range is so extensive, we guarantee that you will always find a panel to suit your tastes and budget. If your specific color is not mentioned, please ask our experts. We offer customized lengths for real estate developers and major projects to minimize waste resulting in impressive cost savings. 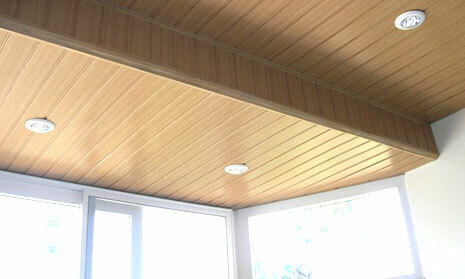 Panelast Ceiling Panels can be used almost anywhere to beautify the ceilings. All our panels are tongue and groove and you will only need simple tools to fit them. Panels can be suspended using screws to metal hanger brackets or attached to a wooden framework. Panels can also be fitted to roof using adhesive, staples or screws. We also offer a full range of PVC finishing sections such as corner frames, internal and external corners, coving and skirting boards that ease the task of fitting and ensure a perfect finish; however your room is shaped.